Let the scoreline not disguise you of what was a terrific Test series. From the magical Anderson doing his tricks to Virat Kohli thumping his authority, from the young Sam Curran's bravado to perennial Ishant Sharma wreaking havoc on English left-handers, you name it, this series had it all for cricket fans across the globe. There were some unexpected and exceptional performances from the players on both sides but there were some poor performances too from some of the better players. So, let's see how some of the key players fared in the series. Virat Kohli is always the talk of the town wherever he goes but when he landed in London this time around, he was still the talk of the town but for different reasons. There were murmurs amongst the media and former players that he might just struggle in England again. Well, let me tell you who can answer this question if he struggled or not. Ask Joe Root. His battle against James Anderson throughout the series was one for the ages. You could see two masters in their prime fighting for supremacy. You might say Virat Kohli didn't get out to Jimmy even once, so he wins the battle but all those who saw this confrontation know that it was just the audience that won rather any of these two. 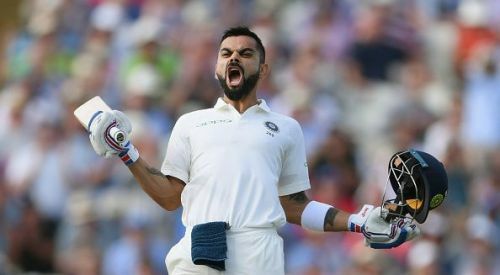 Virat Kohli started of his tour with a brilliant century at Edgbaston and then failing at Lord's under acute back pain and some high-class bowling. But he came back strong with a 97 and a 103 at Trent Bridge. Every time his wicket fell in the series it looked like someone pinned the balloon and everything fell apart. Scoring 593 runs with an average of 59.3 in what were difficult batting conditions, he was outstanding and did everything he could from the batting point of view. But his poor shot dismissal in Southampton was one of the turning points of the series.